Identifying the best products for children of different ages, backgrounds, skills, and interests, the Parents' Choice Awards are given to products that meet and exceed standards set by educators, scientists, performing artists, librarians, parents, and yes, kids themselves. During our twenty-five year history, the Parents' Choice Awards program has established the benchmarks of achievement in children's media; trust for the consumers and credibility with the press. Fewer than 15% of those items submitted to the Parents' Choice Awards program receive a commendation in one of the six award levels: Classic, Gold, Silver, Recommended, Approved, and Fun Stuff, underscoring the coveted and prestigious achievement of being honored with a commendation from the Parents' Choice Awards program. Product categories in the Parents' Choice Awards program include: audio recordings, books, toys, software, magazines, television programs, home videos, DVD, and video games. 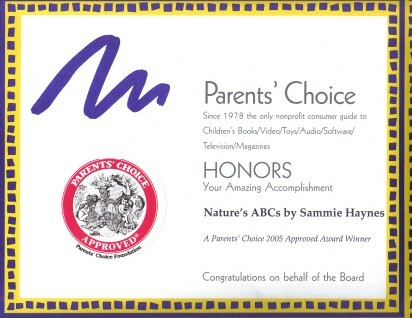 Parents' Choice evaluates, reviews and awards the best products produced for children, be they infants or young adults. Judges in all product categories use General Criteria including excellent production values, universal human values, appeal to children, age appropriateness when making their decisions. The Parents' Choice Awards committees look for products that entertain and teach with flair, stimulate imagination and inspire creativity. Judges are interested in how a product helps a child grow in many ways: socially, intellectually, emotionally, ethically, physically. Products must be free of racial or gender bias. Above all, products must not extol violence. 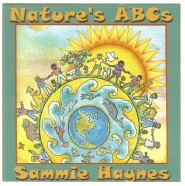 Sammie Haynes' received an award for Nature's ABC's in the Ages 4 and Up Honors Category. "Nature’s ABCs, Sammie Haynes; A Gentle Wind, 2004; www.gentlewind.com. Some down-home country pickin’ tunes, well sung by Haynes as she explores nature and the great big world we all share." The National Parenting Publications Awards (NAPPA) program began in 1990 as a consumer awards program for children's media, including books, toys, music, videos, software, and storytelling/spoken word. Expert judges within each category review and select the best submissions to receive recognition as either Gold or Honors Award winners. Winners are announced annually prior to the holiday season. The Film Advisory Board is pleased to announce A Gentle Wind music CD, Nature's ABC's, has been honored with our Award of Excellence tribute. There are several charming songs for children and other tunes that are composed in the upbeat bluegrass style with many repetitions that children will love. I think they will find themselves singing along with such happy tunes as Nature's ABC's "We're Going on a Picnic" and "What Do You Say". The upbeat tempo of Nature's ABC's is fun for listening and dancing pleasure. Receiving the Film Advisory Board's Award of Excellence recognition gives A Gentle Wind the opportunity to purchase our award seals for display on each CD when you market the title. Please contact our office for our licensing agreement. Thank you for giving the Film Advisory Board the opportunity to review Nature's ABC's. Categories cover music, storytelling, educational/religious, individual songs, and by kids for kids. Age ranges of various categories cover from infant to 12 years. 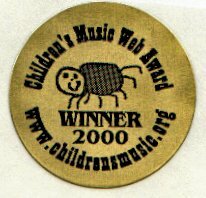 Check out all the stellar 2005 finalists in the only awards that are guided by adults and chosen by kids. Children's Music Web Awards are decided in a multi-step judging process. First, family judges screen the candidates and make preliminary decisions. Then, classrooms and day care centers worldwide pick their favorites. Children's voices predominate every step of the way. Thus, it can truly be said that these are the KIDS' FAVORITES!